At NuFlow Oklahoma, we clean your drains of the debris that becomes trapped within your pipes, including grease, food particulates, hair, soap, and even tree roots, with our excellent drain cleaning services and equipment. We offer our services to Moore and the surrounding cities and promote effective, eco-friendly solutions that can be applied quickly for our customer’s convenience. With our drain cleaning services, we help prevent the problems of sewer backups and floodings by easily removing clogs and offering preventative drain cleaning services that are cost-effective. At NuFlow Oklahoma, we offer hydro jetting as the solution for removing massive clogs, and we include a sewer camera inspection before and after the process as part of our services. With our inspections, we are able to accurately find the clog in your pipes without digging trenches. In addition, this process allows us to be precise and guarantees that the solution we offer for solving the problem is efficient and accurate. Hydro jetting is a popular, practical drain cleaning solution that we often recommend, and should our technicians offer this process as the best means of restoring your pipes back to normal, this method of cleaning promotes the proper flow and efficiency of your pipes. Hydro jetting is employed by our technicians to remove mineral calcification in your pipes, as well as tree root clumps, grease, hair, soap and a variety of other types of clogs and complications. Not only does the force of the water cut through the clogs and force them out of your pipes, the water pressure also allows for the pipes to be completely cleaned, removing buildup along the walls and restoring the smoothness of the pipes. This extends the life of the pipes, renewing their efficiency and preventing the likelihood of clogs forming in the future. Our hydro jetting services are flexible and can be applied to many different pipelines throughout your home, as well as emergency and maintenance situations. Regularly scheduled cleanings promotes proactive care of your pipes, allowing us to catch problems before they become severe and create major problems in your home or business. Our drain cleaning services are designed to be convenient for our customers, and by offering these services outside of emergency situations, we offer security and safety for your pipes with long-term solutions as a result of frequent maintenance. With quick and easy solutions, our drain cleaning services are among the best in the industry, keeping your home safe from needing major repairs or pipeline replacements. With NuFlow Oklahoma, our drain cleaning services are excellent, partnered with talented technicians in the field and practical equipment. Advancements in drain cleaning services make it possible for us to easily clean the drains without chemicals or invasive processes like digging trenches or breaking through the walls and floors in your business to expose the pipes. We’re intent on creating a solution that works for you and offers a long-term fix for your pipes. We foster relationships of trust with our customers, offering patient and thorough explanation of our services so that you are always aware of our process and costs necessary to provide the best repairs. 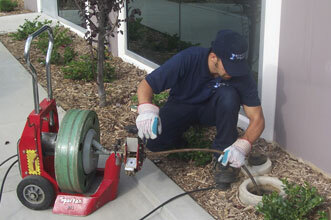 If you need our drain cleaning services in Moore or the surrounding areas, call NuFlow Oklahoma for your needs today.